Swagbucks has a new Team Challenge! 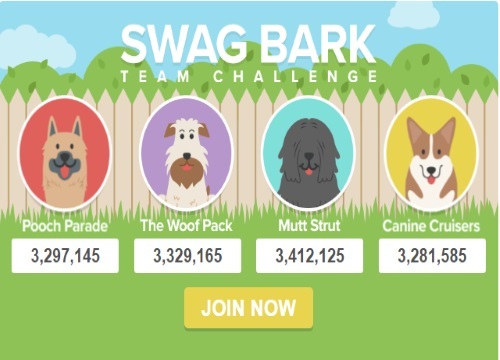 Earn up to 40sb bonus when you take part in their Swag Bark Team Challenge. The Swag Bark Team Challenge has begun and ends at 12pm PDT/3pm EDT on Friday, June 17! Make sure to stick around, it's bound to be a doggone good time. All members who participate and contribute at least 300 points to their team's total will receive a SB bonus in the form of a SB Swag Up Rebate! Members of the 1st place team will receive a 40 SB Swag Up Rebate, members of the 2nd place team will receive a 20 SB Swag Up Rebate, members of the 3rd place team will receive a 10 SB Swag Up Rebate, and members of the 4th place team will receive a 5 SB Swag Up Rebate! Your SB Swag Up Rebate will be made available on Monday, June 20th and will expire on Wednesday, July 20. If you are already a Swagbucks member, click here to be randomly assigned a team. Click here to join Swagbucks.